The U.S. Census Bureau estimates that nearly 12% of Americans move every year. That means a significant portion of your address records will become inactive in any year without NCOA services. If you send mail to 1,000 contacts, then 120 of your mail pieces won't be delivered to the intended recipient. NCOA services improve delivery rates in three important ways. First, NCOA provides new addresses for moves within the last 48 months. Having an updated mailing address helps you ensure more of your mail pieces reach their recipient. Second, it identifies other move data, which helps you avoid sending mail to vacant, invalid, or just plain wrong addresses. Third, NCOA standardizes all of your addresses to meet USPS mail standards. This makes it easier for the post office to deliver the mail. There are several steps in NCOA processing that improve delivery rates. Coding Accuracy Support System (CASS) evaluates address-matching software and improves the accuracy of carrier route, 5-digit ZIP®, ZIP + 4®, and delivery point codes that appear on mail pieces. Delivery Point Verification (DPV) identifies whether a ZIP + 4® coded address is currently represented in the USPS® delivery file as a known address record. DPV allows users to confirm known USPS addresses as well as identify potential addressing issues that may hinder delivery. Residential Delivery Indicator (RDI) is licensed by the Postal Service and works with certified CASS™ software or an address standardization tool provider to verify delivery type status. In combination, these steps update and standardize address data. They also help to identify vacant and invalid addresses. Using NCOA to find address updates and excluding vacant and invalid addresses improves delivery rates even further. When your mail list only contains accurate, mailable addresses more mail pieces make it to their intended recipient. When you process a file for free with TrueNCOA you will receive our complimentary report. This provides total 18 and 48 month moves, vacant and invalid addresses, moves by date and state, potential direct mail savings cost and more. If there have been no moves on your file, there is no obligation to purchase. You will even receive free notifications when there is a new move on your file, so that you will know when it is time for NCOA processing. 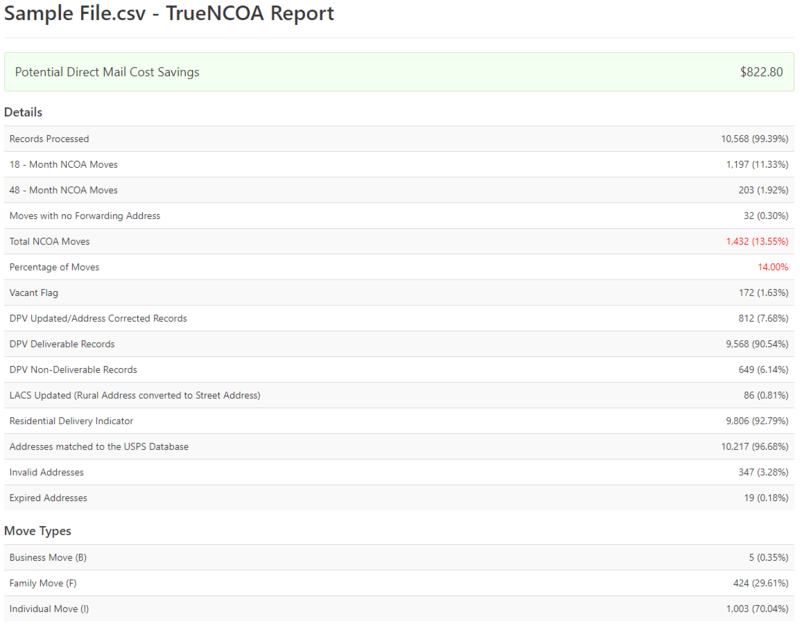 Register for a free account, upload/process your file, and instantly view our complimentary TrueNCOA report. If you would like to make a purchase after reviewing the total number of moves and estimated savings, your file is available for immediate download.